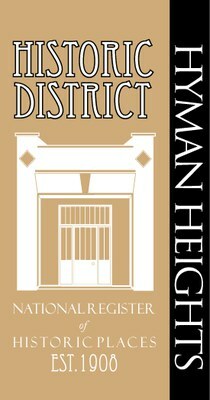 History – Hyman Heights was platted in 1908 and eventually merged with the Mount Royal section, which was platted in 1923. The area began its real growth with the opening of Hendersonville’s first hospital, Patton Hospital, in 1913 on Highland Avenue. Many local physicians built homes in the neighborhood during the hospital’s life in styles such as Craftsman Bungalow, Colonial Revival, Ranch, Four Square, and others. Killarney, a stone Gothic Revival, is the oldest home dating to 1858. There are 123 contributing houses/outbuildings. House construction dates are based upon 1912, 1922, 1926 and 1954 Sanborn maps used in the field; city directories from 1915, 1926, and 1937-1952; owner-provided information; and deeds. The 1915 and 1926 directories are not broken down by street addresses, so without checking deeds on each property it was not possible to link an owner with a specific house. Therefore, many of the houses are named for the owners of record in the directories in the late 1930s since there is a gap in the available directories from 1926 to 1937. The 1937 directory is the first time in which street addresses appear. These sources are noted with each entry. Contributing properties must be at least fifty years of age and retain their original form. The application of artificial siding, changing of window sash, the addition of modern doors, the screening of a porch, and additions placed away from the main facade of the building are features which are allowed under this classification. Non-contributing buildings are those which are less than fifty years old, or older buildings which no longer retain their original form. This would include the placement of additions which alter the main facade, or enclosure of porches which severely alters the configuration of the entry to a building. If windows are altered through the retrofitting of a smaller window frame within the original opening, this will also make a building non-contributing.